Product prices and availability are accurate as of 2019-04-16 01:43:24 UTC and are subject to change. Any price and availability information displayed on http://www.amazon.com/ at the time of purchase will apply to the purchase of this product. FREE USA flag decal for back of helmet, exclusively from THE SPEEDY CHEETAH! An exact replica of what the players wear on the field. Helmet sold for display only and includes no-wear safety shield. 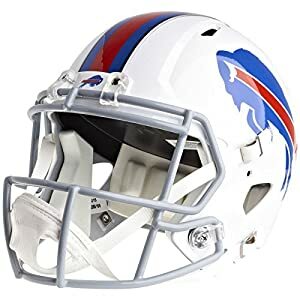 Officially licensed NFL helmet including your team's colors and logo. Team name or logo on front. Team nameplate on back (NYG, PIT, KCC, CLE & WAS prefer blank). True-Curve aggressive ABS shell, steel polyvinyl-coated facemask, molded jaw pads and 4-pt chin strap.